I’ve been asked to write a few blogs about my favorite places to eat in Seattle. I hope to write about Monsoon, Coastal Kitchen, Harry’s Bar, and several others. Since I spend most of my days in the kitchen for work, I must say having someone else do the cooking and clean up is a real incentive for eating out! My most favorite place to dine these days has got to be Monsoon on 19th Ave East. Just 5 blocks down Aloha to 19th and to the right a block or two, sits the recently renovated and expanded Monsoon. In and outside seating, open windows and lovely understated décor makes Monsoon not only the best place to eat but a lovely relaxed atmosphere as well! They have an excellent happy hour: 3:30pm to 5:30pm. Summer time allows us to sit among the trees on the roof top and sip handmade “adult” slushiness. The fruit ones are always delicious. Crunchy freshness abounds in the tasty appetizers. Meat and seafood lovers seem to enjoy the selections offered daily for lunch and dinner and I being pleased mostly with vegetarian dishes, find plenty to choose from. 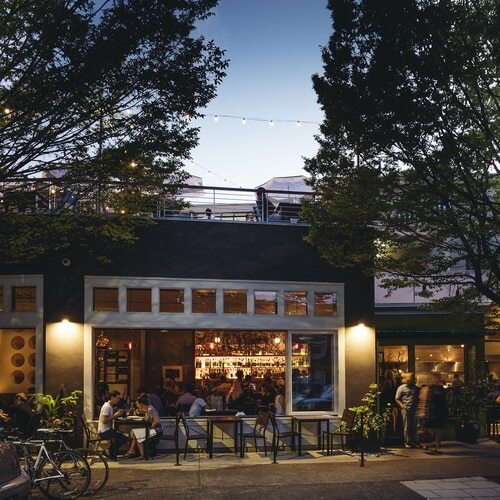 Their food is a combination of modern Vietnamese and Pacific Northwest flare. They offer a plethora of services. From lunch box delivery, group dinning, in and outdoor seating to an ocean bar and tasty craft cocktails. Lunch and dinner, weekend Dim Sum and brunch will please the palate as well. The wait staff is knowledgeable and friendly…I must say, Monsoon is the best of the best places to eat in Seattle. I have sent folks from around the world to dine there and they never leave unsatisfied.